The point at which Botswana meets Zambia is a quadripoint between the Caprivi Strip of Namibia, Zimbabwe, Zambia and Botswana, although there is technically a small no mans land in between that nobody can agree upon. 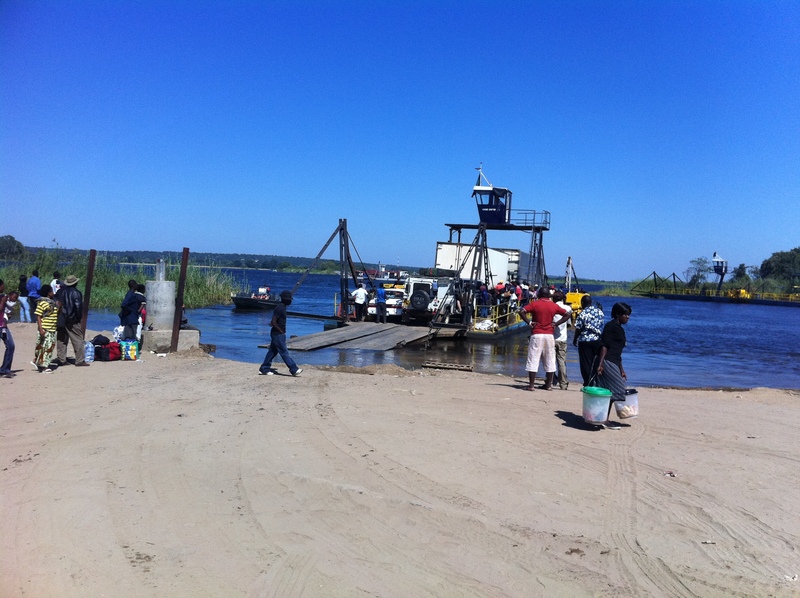 To get across to Zambia from Botswana we took the Kazungula Ferry, which is actually a 70 tonne pontoon and is the biggest and busiest river crossing in southern Africa. Tragically in 2003 this ferry overturned due to being seriously overloaded and 18 people lost their life. 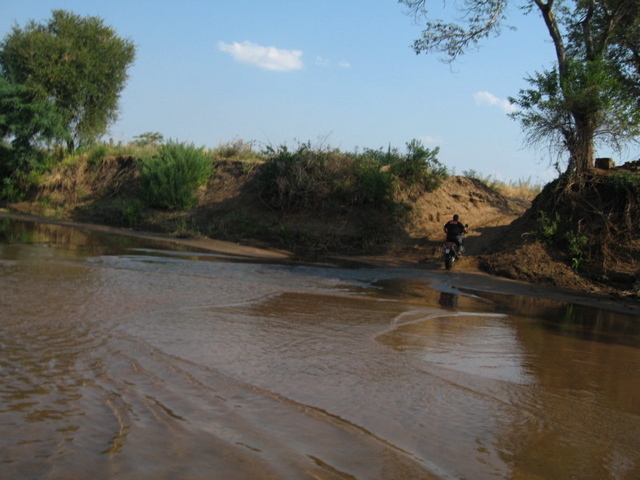 However, at the time Fanny and I were crossing this fast flowing river full of crocodiles and hippos, we were oblivious to this fact, and so we thoroughly enjoyed our scenic ride across one of Africa’s most famous rivers. 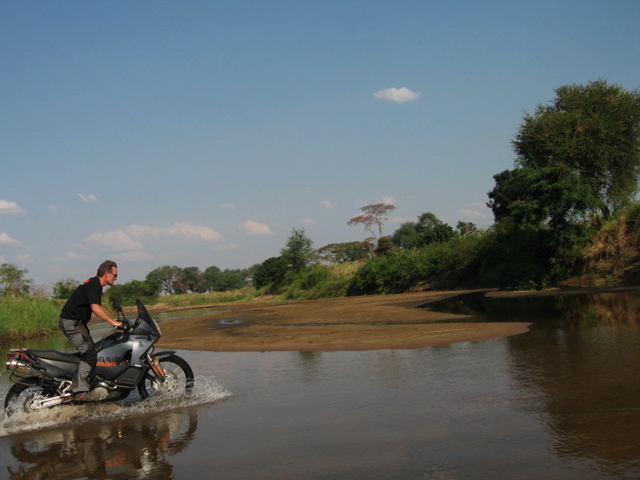 As we were approaching the other side of the river I realized the ferry ramp did not actually reach dry land but rather stopped short in the river and so we would have to do a bit of off roading in the water and then ride up a fairly steep sand bank to reach the road. I called back to Fanny and told her what to expect and to remind her to keep the throttle on, keep her head up and not to hesitate. She was in a confident mood and seemed fine, and so we both powered off the ferry ramp, splashed through the water and slid up the soft sand bank, much to the amusement and pleasure of all the other people on the ferry and those waiting on the other side as they all clapped and cheered. We were now in Zambia. 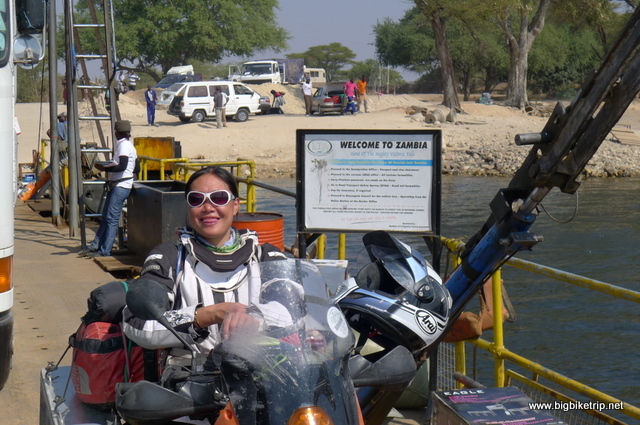 The ramp off the ferry … good fun on a motorcycle… provided you don’t drop the bike into the water when getting on and off. 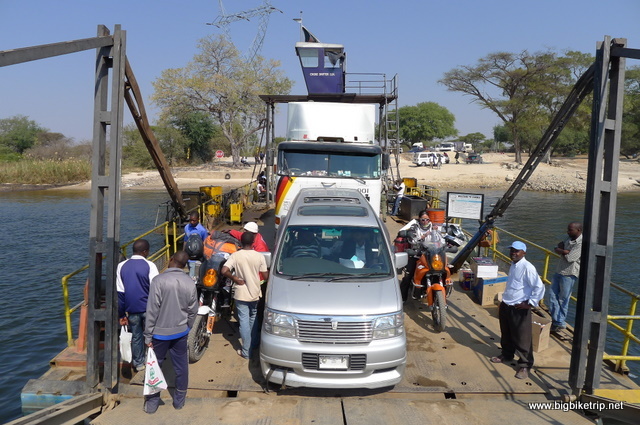 After reaching the other side we rode along a sandy road for about 200 meters and were now faced with the scruffy assortment of buildings and shipping containers that made up the Zambian customs, immigration, police, military, tax bureau and various insurance companies. At the border crossing itself was an assortment of “in your face” currency traders and pseudo officials trying to make a profit exchanging various bank notes and scamming stressed travelers as they attempted to negotiate the inefficiencies of third world red tape and come to terms with the general pace of officialdom in these parts of Africa –i.e. slow and very slow. I was a bit worried about leaving Fanny among all these dodgy characters and taking my eye off two motorcycles loaded with our worldly possessions. 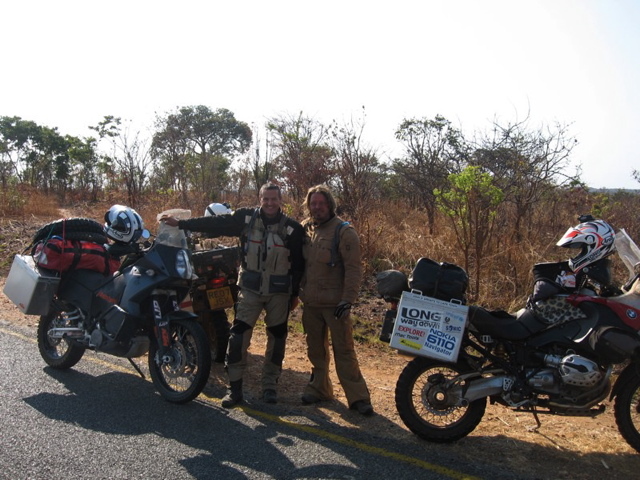 However, there was no choice and one of us, me as it happened, would have to do the rounds with our documents and get ourselves, our kit and our bikes through Zambian customs and immigration and whatever else the Zambian authorities thought was a good idea to relieve tourists of their cash. I was also worried about getting Fanny into the country as we had heard mixed reports about whether they would issue her a visa in her Chinese passport at the border. The customs and immigration officials, currency traders, and insurance brokers needed to be engaged with very carefully, requiring a fine balance of patience, efficiency and jaw aching charm. As we navigated our way through all the officials and an indifferent insurance saleswomen I had to do a double-take to make sure some of these people, especially the women, were actually still alive, such was the inanimate nature of their movements, expressions and seeming lack of enthusiasm for their own existence. This was a far cry from the ant-like scurrying about and general disdain for wasting time that we always encountered in China. Cruising along … some stretches of road had been repaired and were quite good…much better than the last time I had ridden along this route. 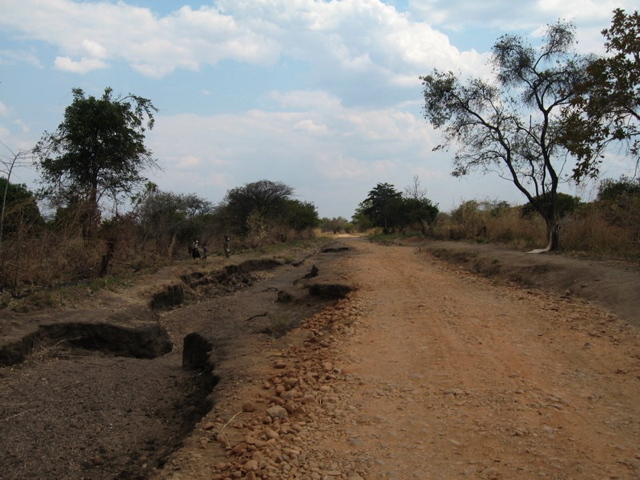 On that occasion I had ridden into Zambia from the Caprivi Strip and there were more potholes and craters than tarmac. Now the Chinese engineers had been busy and the roads were pretty good. 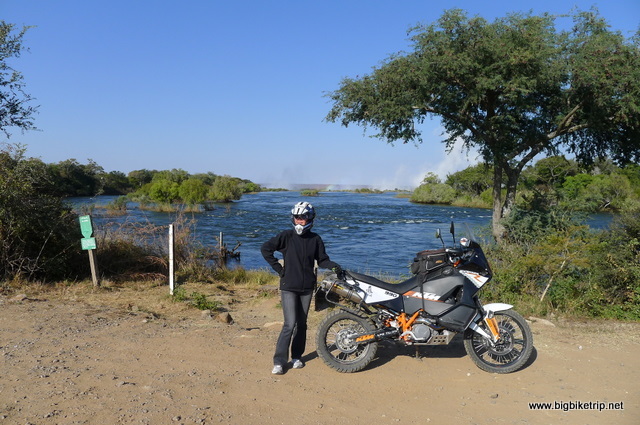 Fanny just upriver by a few hundred meters from Victoria Falls in the background. A bone of contention was the requirement to pay a carbon emissions tax for two Austrian built motorcycles with state of the art catalytic converters and minuscule carbon footprints. With not a small amount of irritation I eyed a burning tyre and several charcoal burners behind the carbon emission tax bureau office where I had no option but to part company with US$18 and fill in a rain forest worth of paper with exactly the same information I had already written out several times on other forms. As I waited in the slow moving queues I caught a glimpse of Fanny who remained with the bikes outside in the dust and heat. She was in good form, but clearly the target of repeated harassment by the dodgy looking characters who always seem to mill about at border crossings. Good luck to them. They had met their match with this Chinese girl and they were wasting their time. She can give as good as she gets and is a very tough and calm cookie. I watched her protecting the bikes and warding off the various touts firmly, but with obvious good humour, tact and accompanied by roars of laughter. 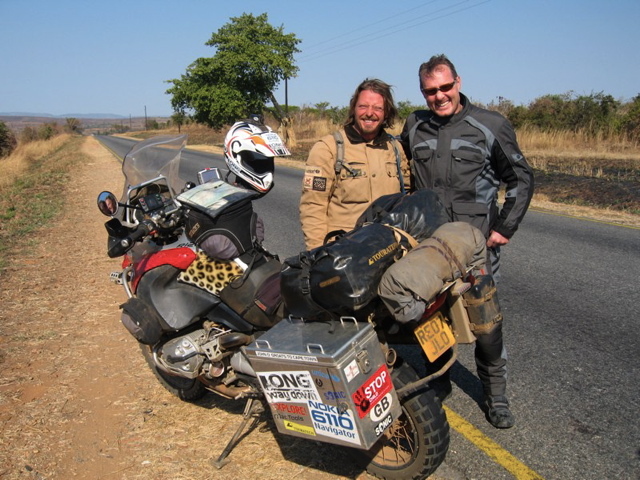 We later heard that an expedition of Chinese riders on military style Chang Jiang 750 motorcycles and side cars, intending to ride cross Africa, had been harassed and harangued so much by African officials for bribes that they had to abandoned their expedition and leave some of their bikes at a border crossing and return back to China. By rough calculations there are an estimated one million Chinese on the African continent sourcing natural resources and negotiating contracts for mining concessions, logging rights, and indeed securing licenses and permits to build luxury hotels, shopping complexes and Chinese factories. 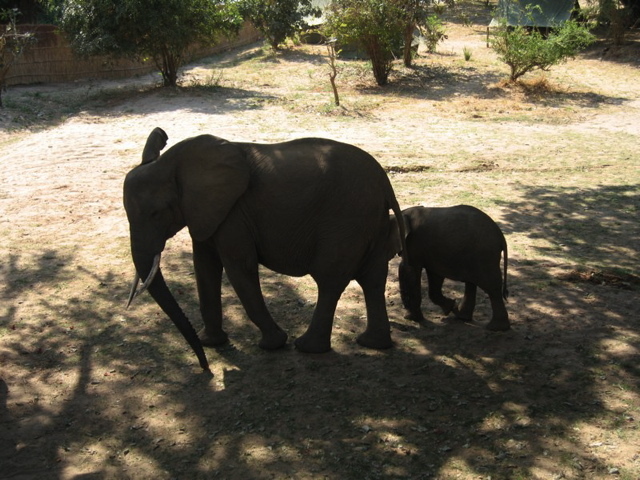 The trading and smuggling of African booty such as ivory, rhino horn, sharks fin and abalone continues unabated and business is brisk and lucrative on both sides and so corrupt Africa despots and their cronies definitely have a large and ready supply of income from China. 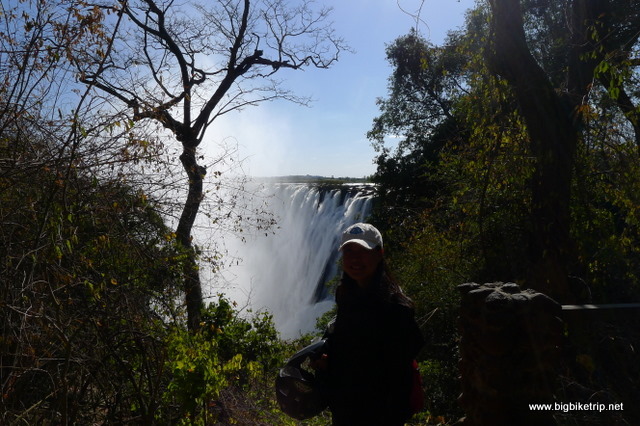 After I handed both our passports over to the immigration officials, I was told that we would have to turn on our heels and return a thousand plus kilometers back to Botswana’s Capital, Gabarone to apply for a Zambian visa for Fanny’s Chinese passport. Heck! Contrary to what we had been told they would not issue the visa at the border. This was not good news and so started a two hour period of intense negotiations. There was a none too subtle suggestion that some sort of cash payment would make the problem go away, but we had no intention to pay anything that was not strictly required by law. After making it patently clear we were not paying any bribes, nor going back to Botswana, a Zambian visa was eventually put in Fanny’s passport. 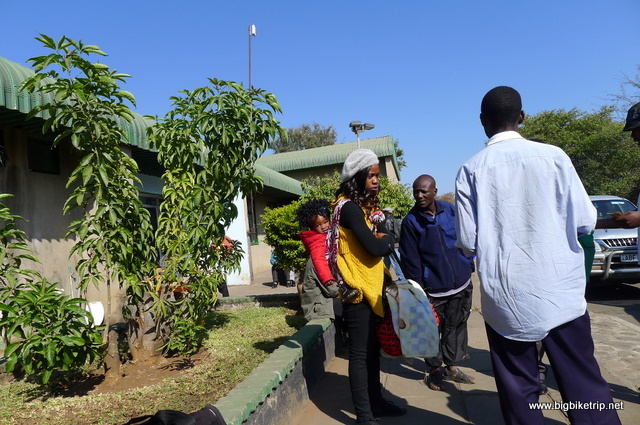 Diplomacy, integrity and fair play won the day and so we escaped from the border post and headed towards Livingstone through clouds of wood smoke, dodging domestic animals along pot holed roads. We also saw our first big snake, a two meter long bright yellow thing stretched across the road and taking its time to get to the other side. It was very lucky we never ran it over such was our haste to get away from the border crossing. 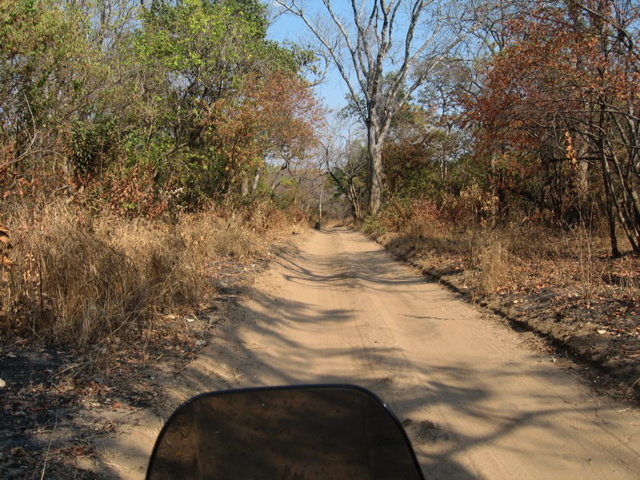 The road from the border at Kazungula to Livingstone was only 130 kilometers and I set our course on the GPS to the only place we could really afford in touristy Livingstone, Jollyboys Backpackers, the Mecca of overland tours. 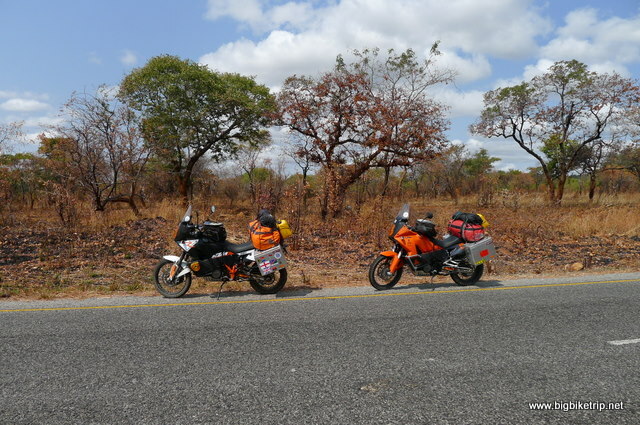 The ride, even dodging the famous Zambian potholes, was good fun and we arrived in Livingstone in just over an hour and set up camp with several groups of lardy and overweight western youngsters who were doing various tours. These “overland” tours run all over Africa and cost anything from one to five thousand pounds depending on how far they are traveling. They usually comprise of about ten to twenty travelers, mostly youngsters, although we did see some older groups especially from northern Europe. The tours also include a guide, a cook, a driver and a beefy 4×4 truck loaded up with safari camping gear and cooking equipment. 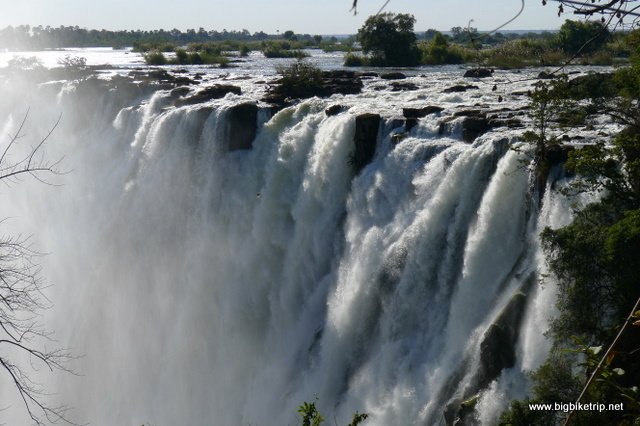 The activities offered in popular destinations like Livingstone include bungee jumping off the bridge that connects Zambia and Zimbabwe, white water rafting down the various rapids, micro-lighting over the Falls, booze cruises on the Zambezi and going on game park safari tours. 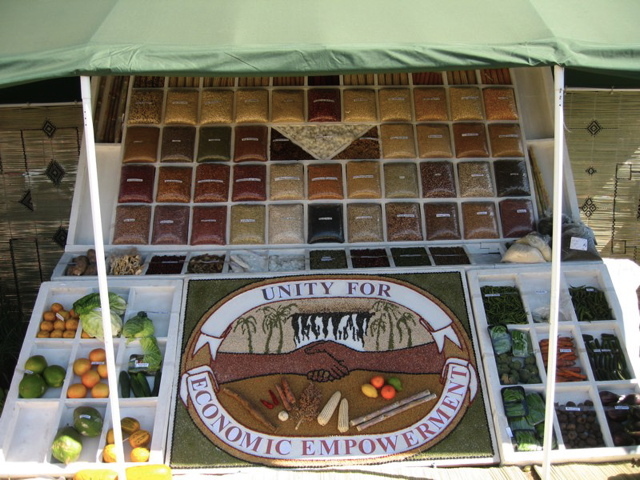 It also appeared to be an opportunity for students and young people to escape from their parents, make new friends, and enjoy the herbal delights of places like Malawi and report their activities and post their photos on social media. I suspect that Jollyboys and other such backpackers on the “overlander” routes do not charge the tour operators very much for staying, but make their money by providing pizzas, chips, pies, beer, internet access and organizing group activities. 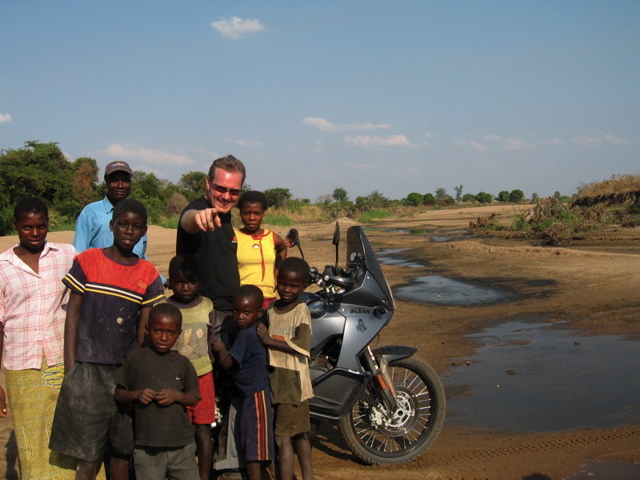 I think its quite a good way to see Africa and make new friends, however it is not cheap and being stuck on a bus for weeks on end is not Fanny’s or my cup of tea. Food wise, we do not like pizzas very much, nor the lard and sugar laden fodder that is usually served up at backpackers like Jollyboys and so we checked out the “restaurant” section on our Garmin GPS and found a little place hidden only about 300 meters from the lodge called “Laughing Dragon”. You don’t need to live in China to know with a name like that it’s unlikely to be a burger bar. Laughing Dragon turned out to be a rather modestly furnished and simple Chinese restaurant that served high quality food. On our arrival Fanny reverted immediately into her due diligence investigation mode and within ten minutes had inspected the kitchen, done the background checks on the owner, the cook, their family, the provenance of the ingredients in the pantry, and most of the establishment’s customers. 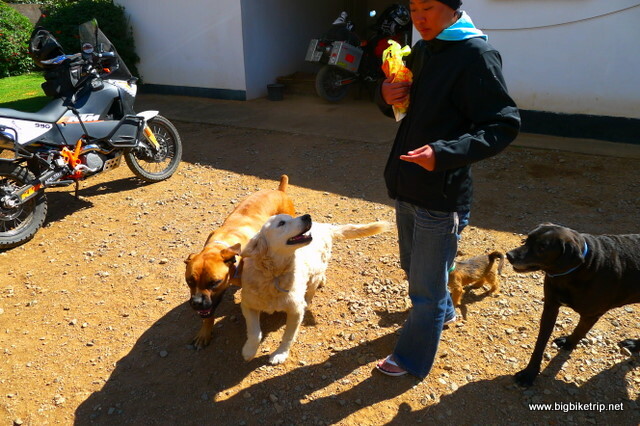 She came bounding back with her positive findings and was excited, as was I, that the owner and cook came from Chong Qing and that meant the food would be spicy, chilly hot and delicious. Fanny ordered a feast and used the word di dao rather a lot, which means authentic and reiterated the point that we wanted the genuine article, not Chicken Chow Mein, fortunes cookies and the bean sprout slop they served the local punters. No Qing Dao beer this time as Zambia is the land of Mosi beer. It’s not as nice as Namibia’s Windhoek beer, nor the beers from Malawi or Tanzania, but it was cold, wet and alcoholic. The food arrived and it was excellent. 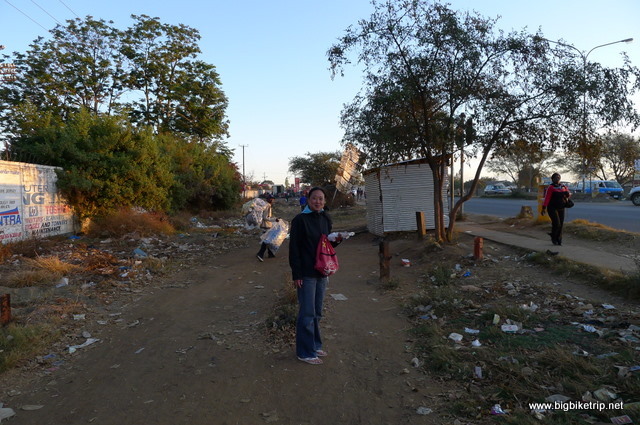 Fanny negotiated an extremely good discount from the lao ban niang (boss lady) so that we paid near enough the same price for an authentic Chinese meal in Zambia as we would in China. We were soon joined by various other Chinese people who lived in and around Zambia and who worked as engineers and contractors on various infrastructure projects, such as road building and luxury hotel construction. We met a fellow Shanganese man who was a former Government diplomat based in Africa for about two decades and now owned and managed fifty thousand hectares of forest in Zambia. That is a huge amount of land. I asked him how he likes Africa and he was very positive, saying that he loved the fresh air, environment and business opportunities. I asked how he managed to protect his business interests in Africa and he said, as is the case in China, that one has to build and maintain good guangxi and renmai (connections and networks). Did I know what he meant? Yes. I suspect I did. 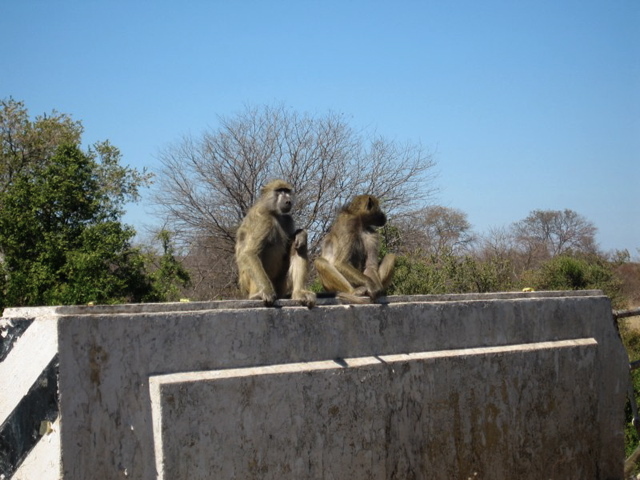 Livingstone is dominated by Victoria Falls and the Zambezi River and this is what most of the visitors come to see and indeed what Fanny and I wanted to see. 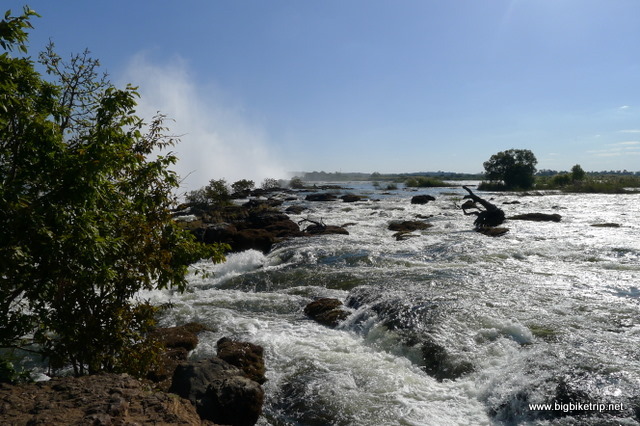 Apart from the surrounding natural beauty, Livingstone is a bit of a tatty rundown town, but towards the Falls there are high end hotels on the banks of the Zambezi with stunning views . Of course, these were all way beyond our budget and the guards knew full well not to let in riff raff like us and so we had no choice but to fork out the US$20 entrance fee to get in the Victoria Falls national park, look around, take pictures of the magnificent waterfall and get wet from the spray. The last time I saw the Falls I waded across the lip of the falls to an island, as many others did. 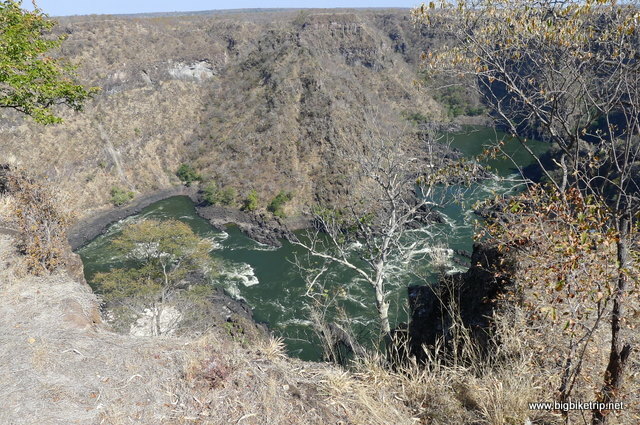 This time the Zambezi seemed very full from heavy rains that had fallen in Angola and any such paddle would inevitably lead to being washed away and over the edge. 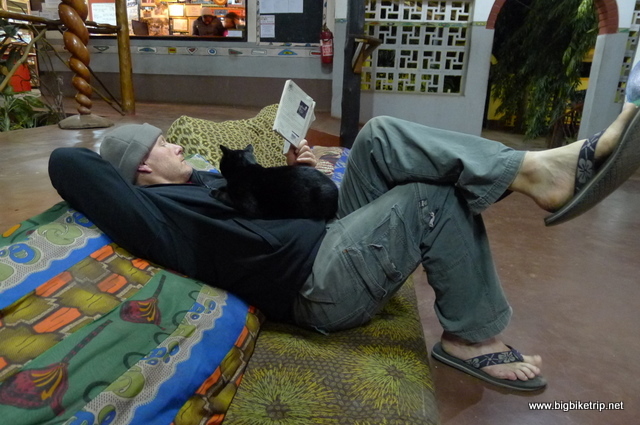 Relaxing at Jollyboys back packers in Livingstone with a friend. 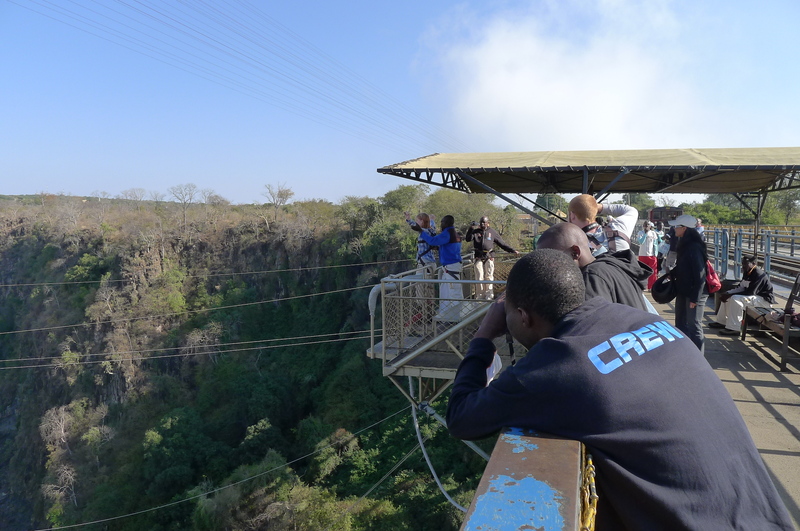 We also went to have a look at the border and got an exit pass from Zambia and walked over the bridge towards Zimbabwe to watch other tourists bungee jumping. Not something I cared to do or indeed actually like to watch too closely. I asked Fanny if she would like to try. No was the emphatic answer and that was that. I guess riding an adventure bike everyday is excitement and challenging enough. 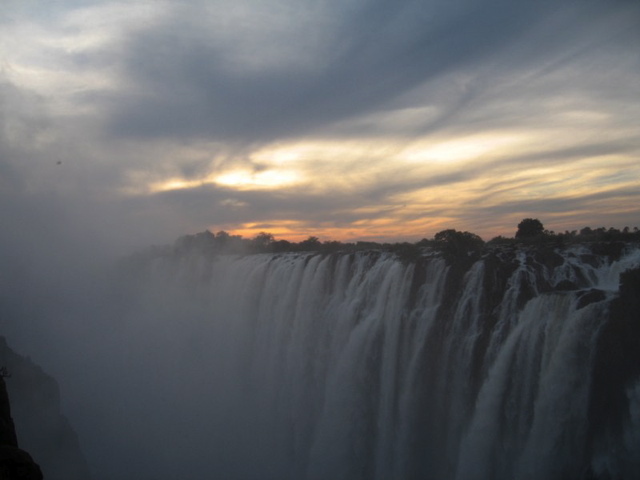 We stepped over the white line that separates Zambia and Zimbabwe and then stepped back despite being told by various touts and scammers that the view from Zimbabwe was much more spectacular. 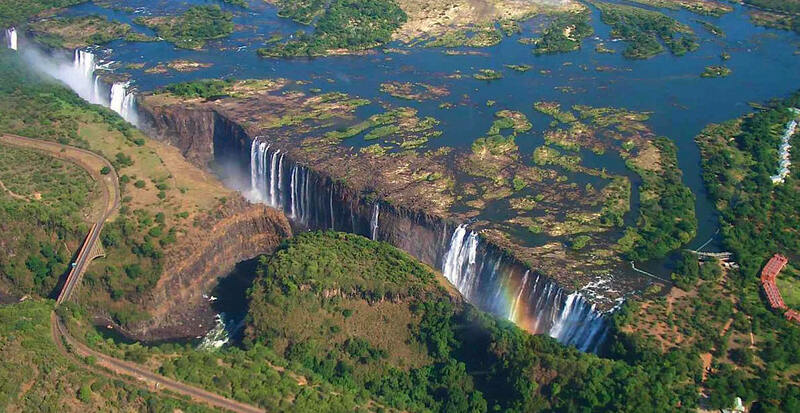 It looked spectacular enough to me, although one day I would love to ride across Zimbabwe, a beautiful and fascinating country ruined by its despot president, Uncle Bob. Whilst in Zambia we heard the news that a new kimberlite of diamonds had been found in Zimbabwe and I know from my former employ that not only will investors and businessmen rush in, but also accountants and lawyers in the wake of the gold rush, thus providing a legitimate lifeline to this lunatic and his henchmen. 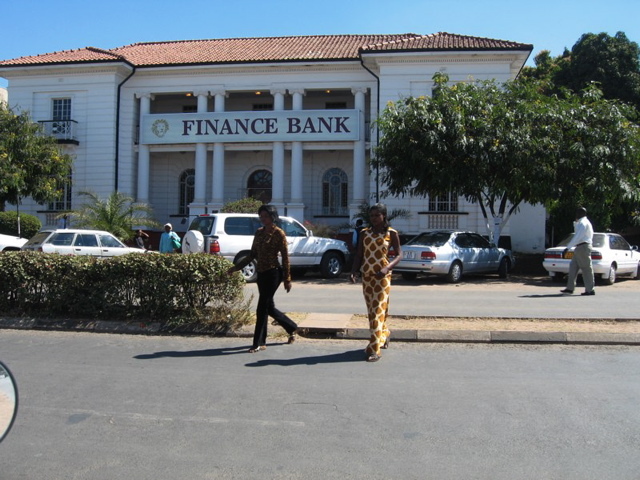 Will the life of the average Zimbabwean be any better? Lets hope so. 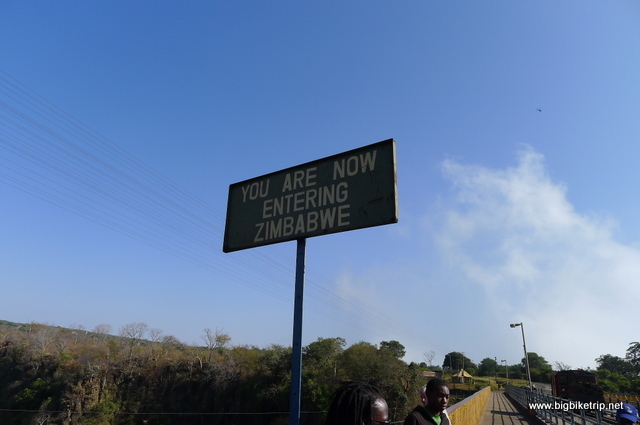 Comings and goings at the Zambia/Zimbabwe border. The little girl in the back pack had amazing hair. 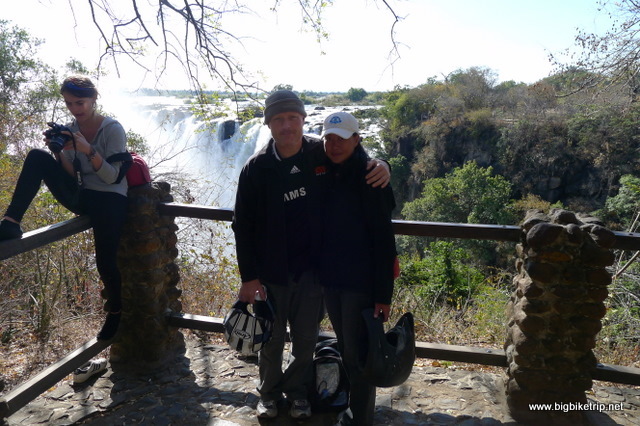 A couple of soldiers or security guards who tried to chase us away from looking at the Falls. We just ignored them and they gave up. 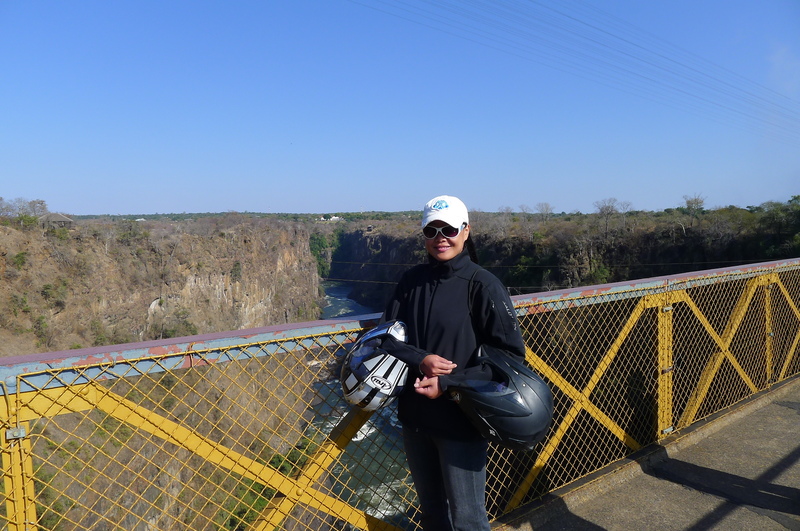 We decided to spend the afternoon exploring the track less beaten and so we left Fanny’s KTM at the camp and she rode pillion on my motorcycle as we rode through many local villages and high up above the canyons which are located down stream from Victoria Falls. 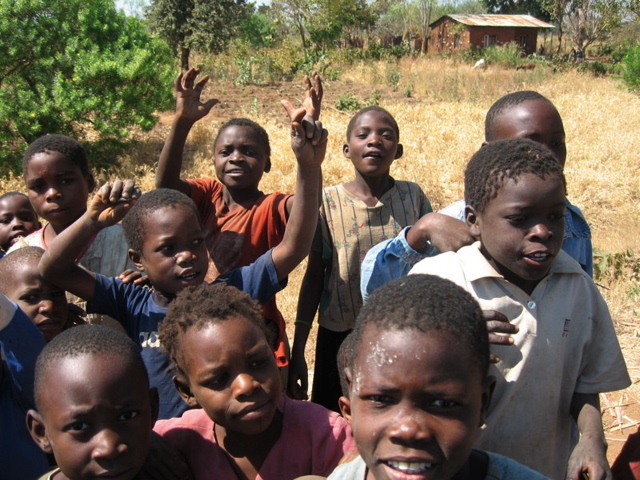 As we passed through village compounds hundreds of children would come running up, beaming white smiles and waving. As Fanny was on the back I could take a break and hand over official ‘waver back’ responsibilities to her. At the cliffs of a canyon above a section of rapids called, unimaginatively in English, Rapids 14 we accidentally rode into an American missionary set on the cliff top. 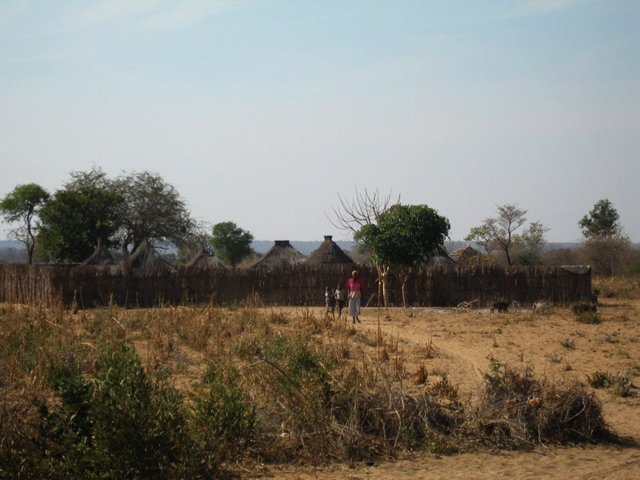 I could not help but notice that the complexity and quality of its buildings contrasted sharply with the villages we had just ridden through, which were all very basic thatched huts in circular compounds. We were received very hospitably by an American lady called Laura who had been at the mission for several years and showed us around and told us about their work. We were very kindly invited to stay for free and partake in some of their evangelist sessions, but we politely declined. Despite already paying to stay in a backpackers in the centre of town that was full of chubby “like toadally, like aahsome” American and British teenagers, I am deeply suspicious of missionaries and their attempts to convert the natives, despite any possible altruistic motives. Fanny is a product of modern day China and thus A-religious and I am a Roaming Catholic of the lapsed variety that thinks belief, faith and superstition are purely personal matters and certainly not to be shared or inflicted on others. As we were making our excuses and leaving the compound on the cliffs I eyed the guitars and tambourines that were lying around with suspicion. Fortunately a turn of my key and the KTM’s Akropovik exhausts drowned out the happy clapping, the preaching sessions and renditions of ‘Big J wants me for a sunbeam’. A lucky escape indeed. Of course you can trust us… just look at our honest faces. 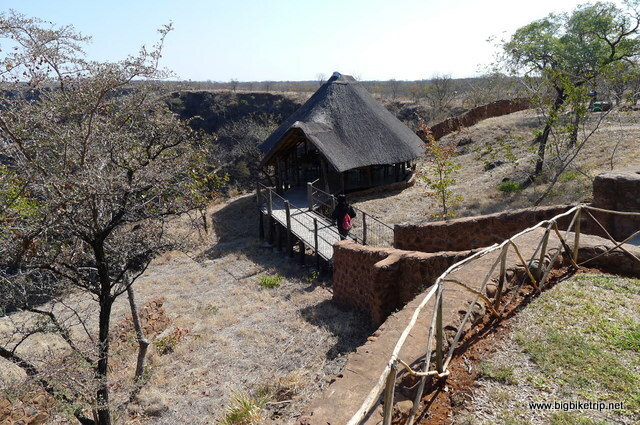 The next day I took Fanny to a small lodge I stayed at four years ago called Zigzags and its this lodge that I recommend any visitor on a modest budget stays at in Livingstone. It’s quiet, safe, good value, has friendly staff, has pretty gardens, close to the Falls and has a great restaurant that serves superb curries and delicious banana or mango smoothies. It’s too easy to whittle away the hours at Zigzags drinking Zambian coffee, especially as there is free WiFi, but we had to make tracks towards Lusaka and that was about 570 kilometers away on roads which I remembered were not short of the odd pothole, or more accurately, bike swallowing craters. 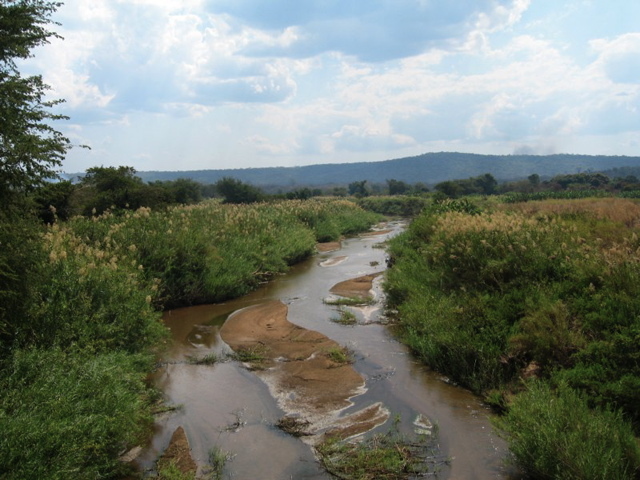 The next day, with military-like efficiency we packed up, loaded our bikes and woke anyone who was not already awake as we departed Livingstone at the crack of weaver bird. As we made quite rapid progress, we passed though village after village, all rather squalid with run down buildings, shop fronts and apparently in decline. The only non derelict looking houses and shops had been painted by the local mobile phone operator in vivid green with their company logo and advertising slogan. 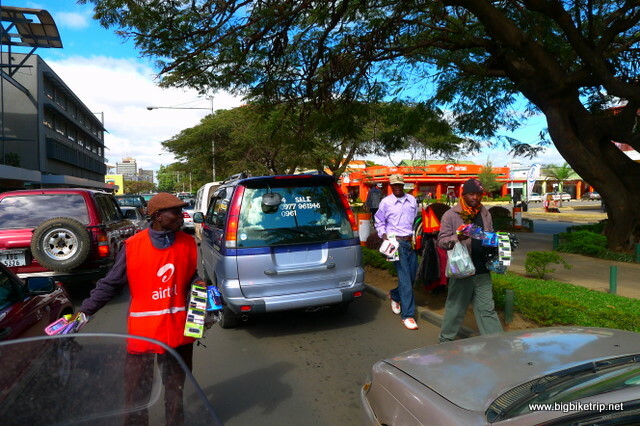 Top up SIM cards and vouchers for mobile phone seems to be a very prosperous business in Africa which is why most are often owned by the relatives of the despot leaders. It did appear as if the Chinese had been busy since the last time I rode here and the roads were not as shoddy as we had been informed they were. 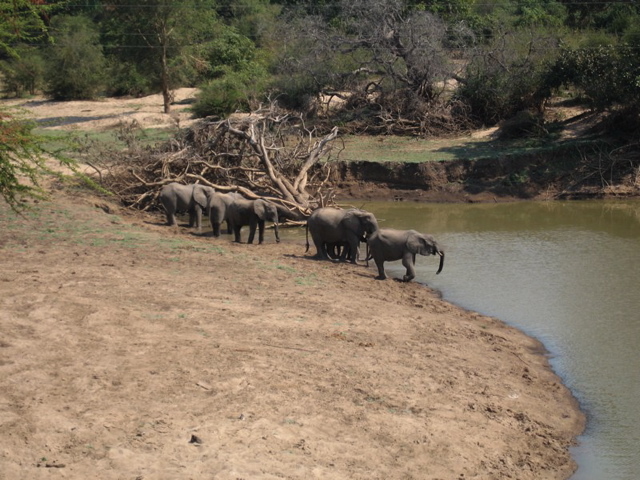 In fact, they were very good and we had a superb cruise though classic African bush and occasionally saw elephants, zebras and giraffes by the side of the road, as well as domestic animals, such as pigs, dogs, cows, donkeys and lots of goats and chickens. As usual there would be lots of young smiling faces who would run out from their homes or the bush and wave enthusiastically at us as we rode past. Women walking along the side of the road carrying logs, charcoal, buckets and an assortment of other heavy looking loads on their heads would often smile shyly at us and wave too. The other thing we saw were lots of cars, and especially taxis that were nearly all Toyota Corollas and all painted an usual shade of blue… the sort of blue colour that would be left in a paint palette after all the other colours had been used up. 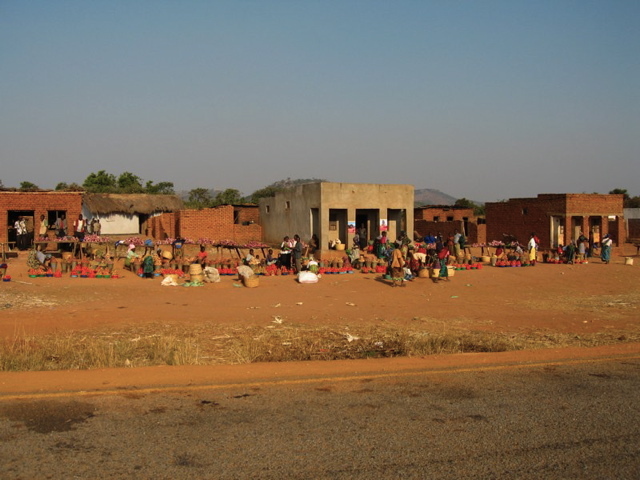 A typical Zambian town that we rode passed on the road to Lusaka. I had earlier received an email from my cousin, Rosie on how to get to her house in Lusaka and we got there in good time having made decent progress on pretty good roads. 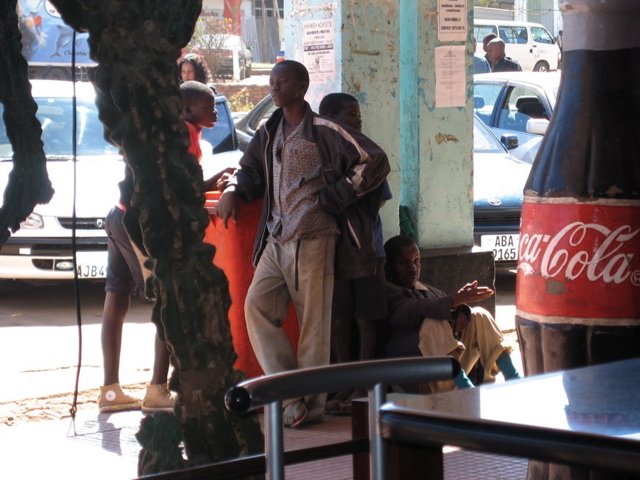 My mother’s, brother’s daughter and son were born and brought up in and around Lusaka and their father Mick, 84 years old, still lives in the centre of the city. My other cousin, Nathan is a wildlife cameraman and Rosie works in the Safari industry, although she has just changed jobs to work for a company that focuses on sustainable agriculture and helping local farms improve productivity. By now, both Fanny and I had sore bums, were extremely tired and as usual clogged and covered in dust and so it was with some relief that we found that Rosie lived in a lovely cottage with a huge garden just outside the city. 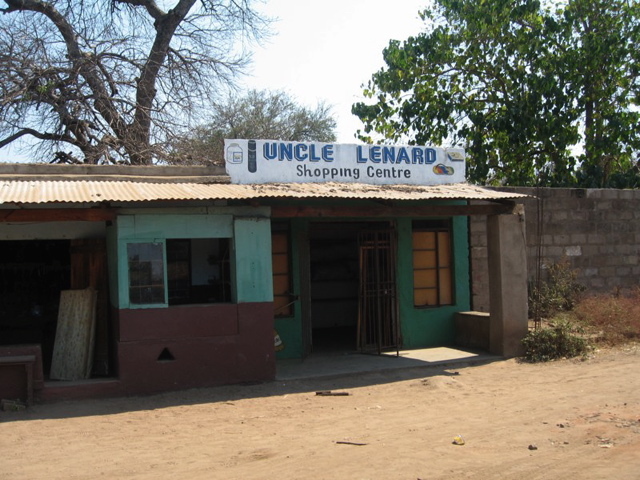 Although she described it as not being in the best end of Lusaka, the cottage was very comfortable, quite large and was secured behind an electric gate and fence, much like the residences in suburbs of Johannesburg. She shared the house with her friend Siobhan and four very odd dogs, one of which is clearly a mixture of Boarbull and donkey, with a head, as described by Fanny as large as mine. After a very welcome shower with hot water (the previous week’s showers had all been cold) we had a very civilized sit down meal with Rosie, Siobhan and another friend Sarah and polished off several bottles of red wine, after which we finally collapsed in a comfy bed with the reassuring rare knowledge that we were safe and our motorbikes secure behind the electric fence. 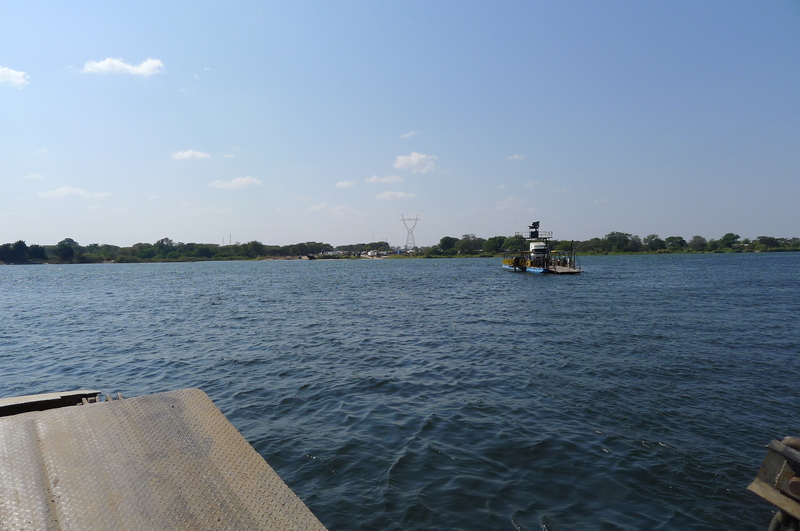 I think its fair to say that Lusaka is not the prettiest city I have ever been to. In fact, it’s pretty grotty, full of ugly buildings, polluted, over crowded and crumbling at the seams. 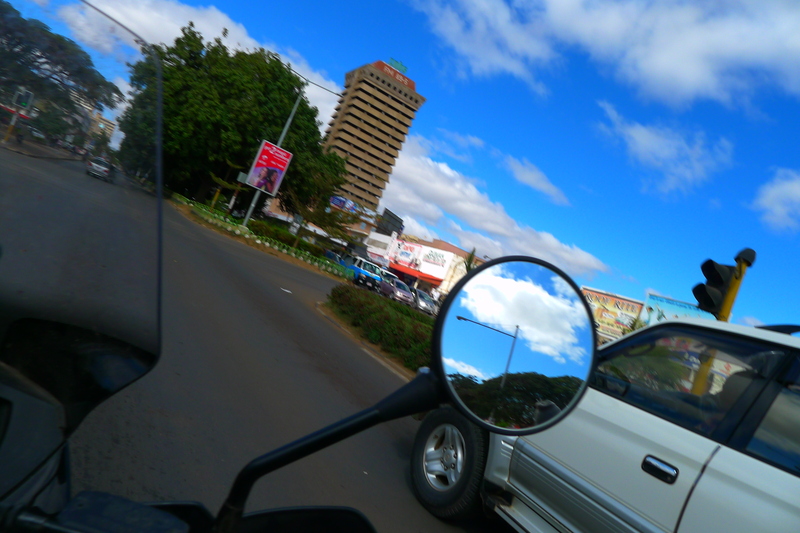 When the traffic does move, it moves in unexpected directions making riding a motorcycle rather an ordeal, hence Fanny’s insistence on riding pillion on the back on my bike in the city. 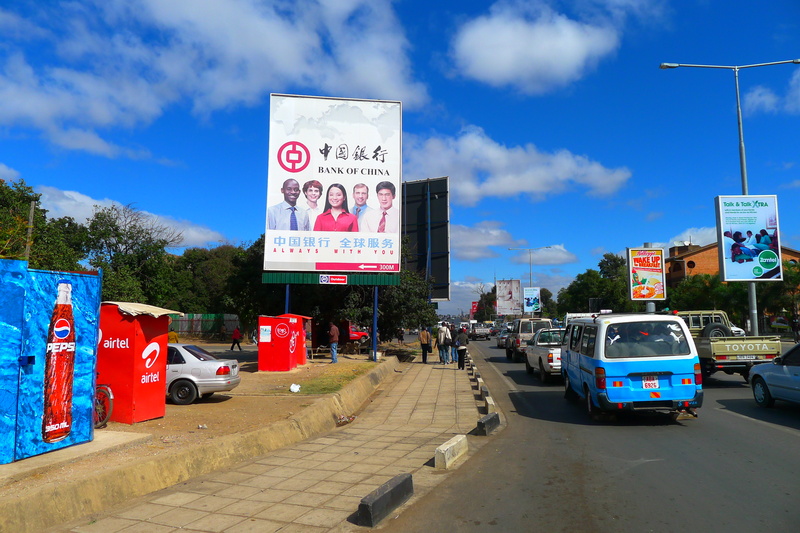 One thing I noticed was how many Chinese signs adorned the billboards of the city. Bank of China, Chinese Casinos, Chinese traders, Chinese backed construction companies and engineering projects. It’s hard to ignore the increasing presence and influence of China in Africa. It is abundantly obvious that in the fifty odd years of independence for southern African countries that the quality of life has only risen (and risen very highly) for politicians and their cronies, and sadly the vast majority of people continue to struggle and suffer in poverty. I suppose you can sum up Africa’s problems with the word ‘AID’: ‘HIV/AIDS’ killing a huge number of people; and ‘Foreign AID’ being squandered by the corrupt leaders and their cronies. I once wrote a paper for the American Bar Association on corruption in China and I now think I was being far too limited in geographical scope. It is everywhere and endemic. Dambisa Moyo, the famous Zambian economist very clearly articulates what is wrong with Africa in her books, Dead Aid and Winner Take All. 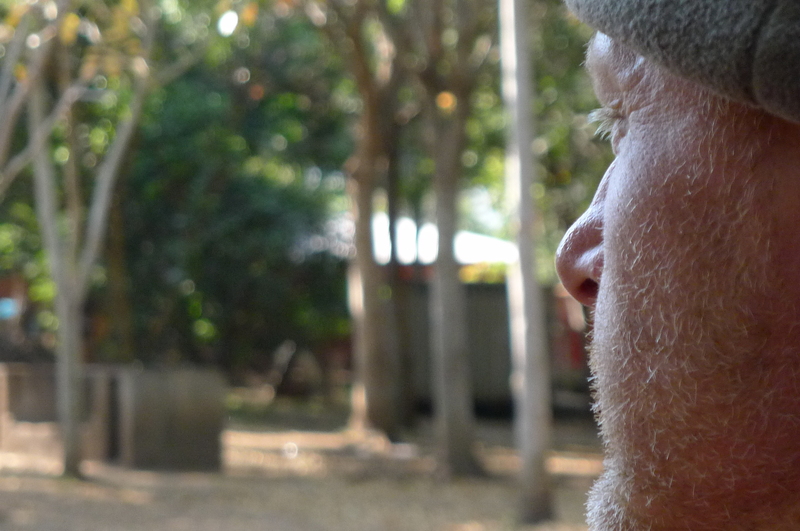 That evening we rode over to see my uncle who lives in the centre of Lusaka and I was delighted to see him in good health, still fond of a decent glass of scotch, but he did appear a bit absent minded and forgetful and I had to remind him who I was. ‘Ah yes, Sally’s son’ he apologised, and added. ‘I saw her yesterday’. This I doubt somewhat, as to my knowledge she is in a wheelchair in Staffordshire in the UK following a recent stroke, but it did remind me just to check up on her in case there is some ‘Tales of the Unexpected’ twist to the story. Fanny and I were both poured stiff whiskeys until we were rescued by Rosie, or should I say I was rescued as Fanny kept tipping her generous glass into mine. 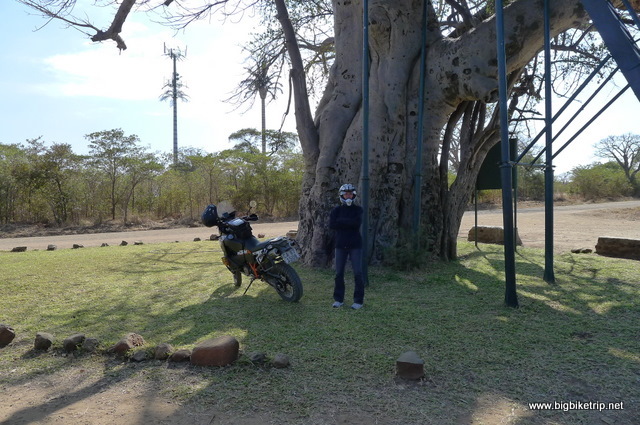 Unable to ride my bike anymore, we staggered to Rosie’s pickup which only had two seats and so Fanny and I were piled into the boot and bumped down the potholed roads to the Lusaka Club for their signature dish, steak and chips. 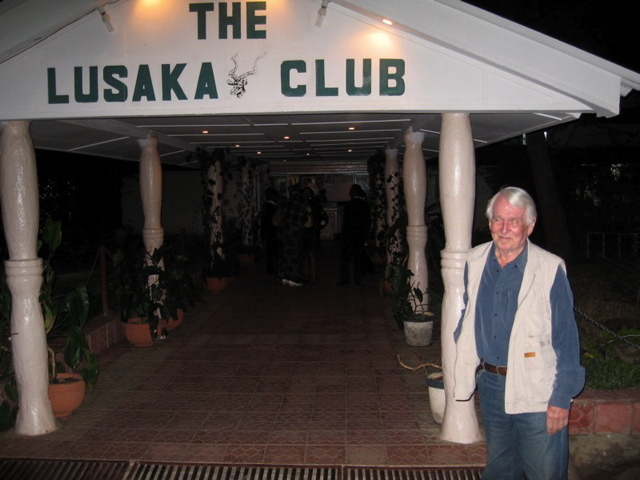 The Lusaka Club has been around for decades and was still thriving on its “all you can eat” salad bar. It seems that all you can eat is quite a lot for Fanny and I would not be surprised if they include a restriction caveat on Chinese guests in the future. We gratefully accepted Rosie’s offer to stay a few days longer, not least so Fanny could wash the grit out of her hair, have a proper hot shower and sleep in a proper bed. 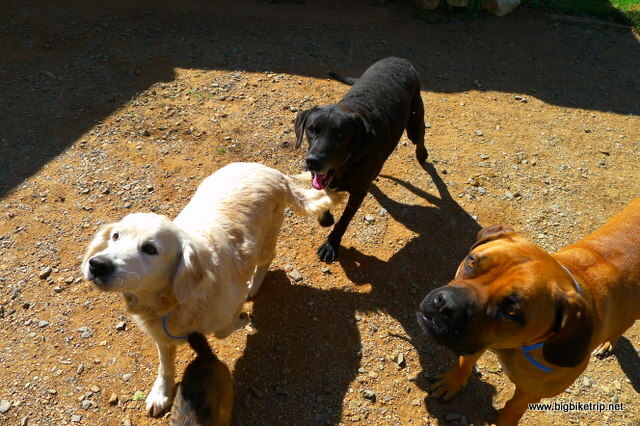 That said, I was also very happy to spend time with Rosie and idle about in safety and comfort for a few days and watch some South African satellite television and catch up with the news. I was captivated by the big uproar in the UK about the phone hacking scandal and watched the alarmingly parochial channel, Sky News’ coverage for several hours on the Commons Select Committees ridiculous interrogation of past and present senior Metropolitan police officers, one of which was Johnny Yates, an outstanding police officer whom I was at Hendon police college with thirty years ago and later served together at Ealing police station in early 1980s. He was being harangued by a clueless and rather repulsive collection of MPs, in particular a mealy mouthed character called Vaz whose questioning technique was poor, pointless and irrelevant, but in keeping with the current UK culture and liking for melodrama, ‘Shadenfreude’ and finger pointing. John, who led the valiant and successful guard against terrorism in the UK, was doing an outstanding job answering questions, despite an onslaught of ‘holy than thou’ bullying and vote seeking feigned indignation from a panel of amateur interrogators. The politicians, many of whom were caught fiddling their own expenses did a good job of reminding me why “Little Britain” is increasingly embarrassing to be a passport holder of. Anyway, enough of all that. I was not in the UK, had not lived there for years and had no intention of doing so. 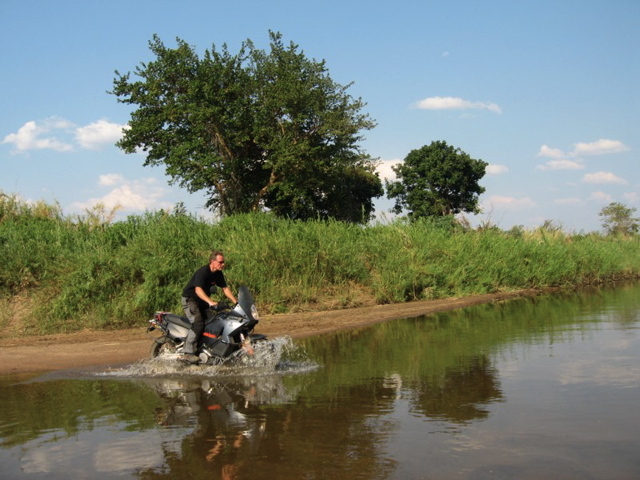 A simple click of the TV remote control and it all went away and I was back in Zambia with a KTM Adventure motorcycle on the way to China with my girlfriend. 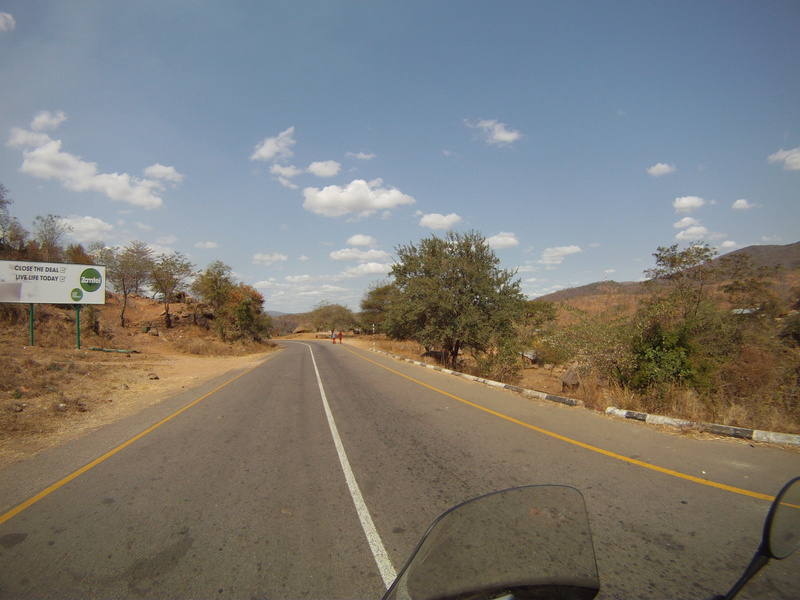 After Lusaka we set off to Chipata, some 570 kilometers away. 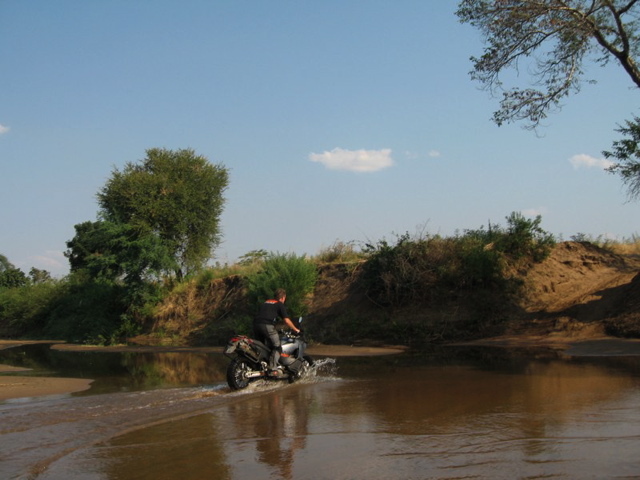 We rode through many very basic villages and passed the spot where I bumped into the “Long Way Down” TV series motorcyclists, Claudio, Ewan McGregor and Charlie Boorman almost four years to the day on a similar motorcycle expedition. 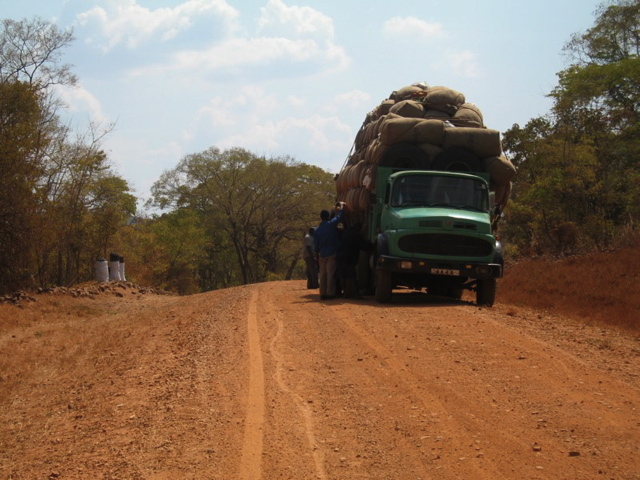 The distance to Chipata is quite long and we kept riding through police road blocks that waved us on, mostly because I saluted which has proved to be a daft, but successful method to induce the officers to wave us on rather than stop and suffer the prospect of having to talk my way out of some bribe. 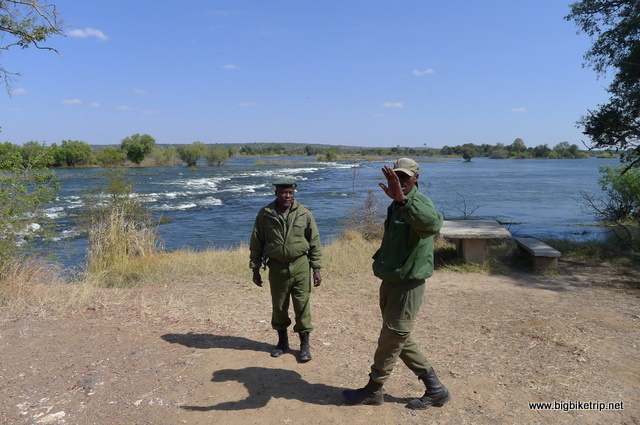 As we crossed the Luangwa River we were stopped by some police officers who asked us if we have lost anything. As far as I was aware we had everything, but they suggested we may have dropped a petrol jerry can and indeed a check of Fanny’s bike revealed that indeed we had. This was a blow as there are few petrol stations on this road and the black market petrol being sold in dubious containers by the side of road is notorious for having other things in it apart from petrol, definitely bad news for an advanced fuel injected and electronically mapped KTM LC8 engine. A quick mental calculation of fuel and day light hours revealed we could not go back the 40 or so kilometers to retrieve the can of fuel and so we carried on. Another blow was that I could see that Fanny’s main beam had blown and for safety I ask her to switch on the full beam. There are many spare parts in our panniers, but 12V/55W H3 or H7 bulbs were not any of them and I wondered how long Fanny could keep annoying on coming traffic with full beam, especially as the light was fading. For safety and indeed because of the failing light, she had to persevere and suffer on coming cars flashing us to dip our lights. 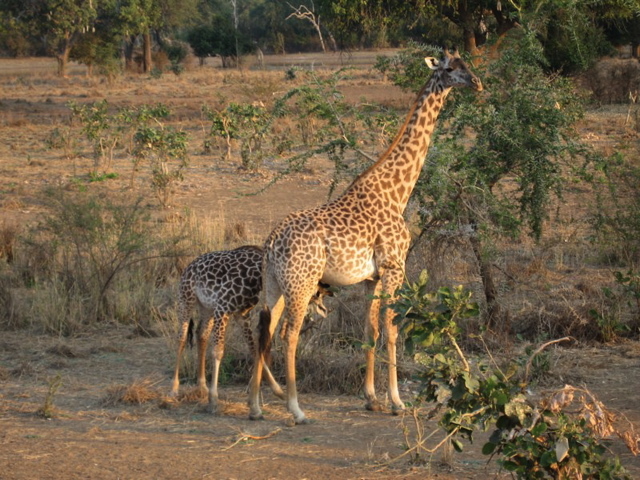 We arrived in Chipata just as the sun had set and followed the GPS tracker to Mama Rulas Lodge on the dreadfully potholed road to South Luangwa National Park. 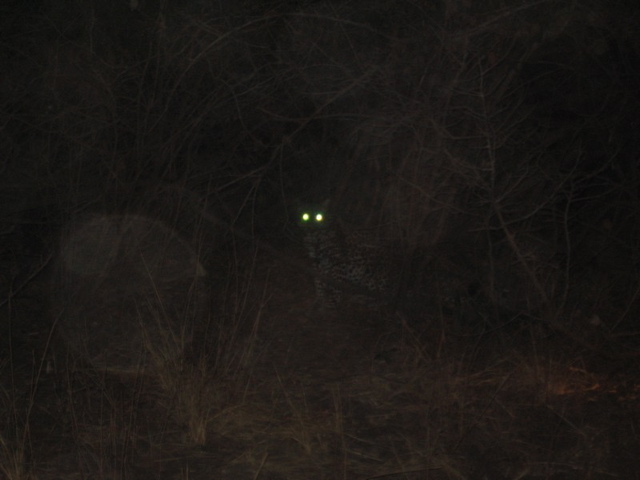 As we entered the camp in the dark looking for a place to camp, I stopped, put my foot down and found nothing underneath my boot and immediately in seemingly slow motion dropped the fully laden bike in front of several groups of fellow campers. 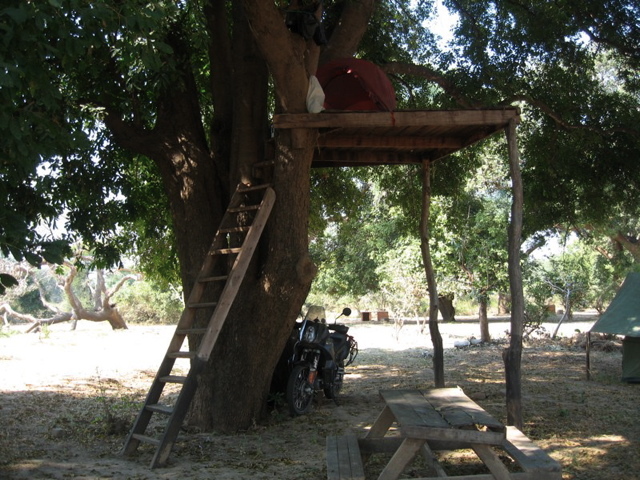 Fanny, who usually does the bike dropping, had found a perfect camping spot and graciously didn’t mention the incident. A German camper who witnessed the fall came bounding up and did mention it, repeatedly, saying something about BMWs to add salt to the wound and then dropped the bombshell that there was no fuel in Malawi. Allegedly, the president of Malawi, one of the poorest countries on the planet, had bought a new private jet and spent all the nation’s foreign reserves and so there was no fuel. My immediate thoughts rhymed with Clucking Bell. 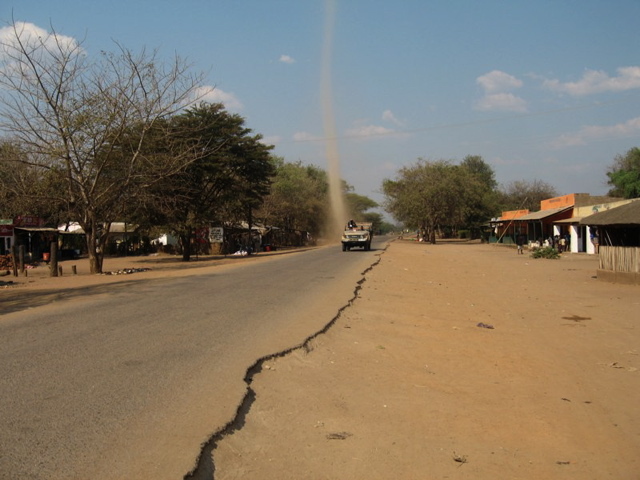 Dust devil on the road. 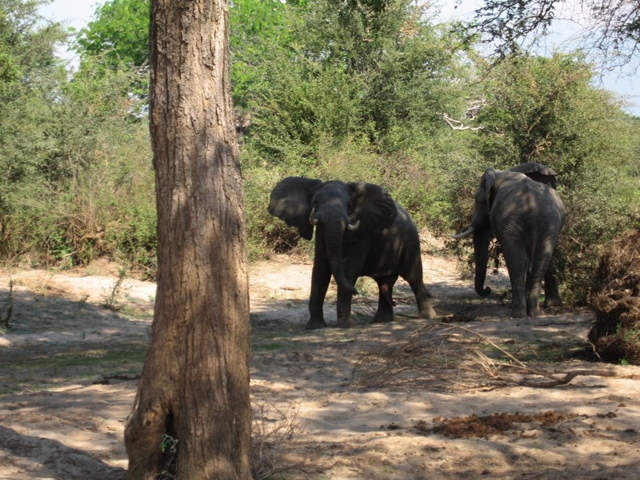 More elephants passing underneath my tent platform. You have to wait until they are a safe distance to get down. 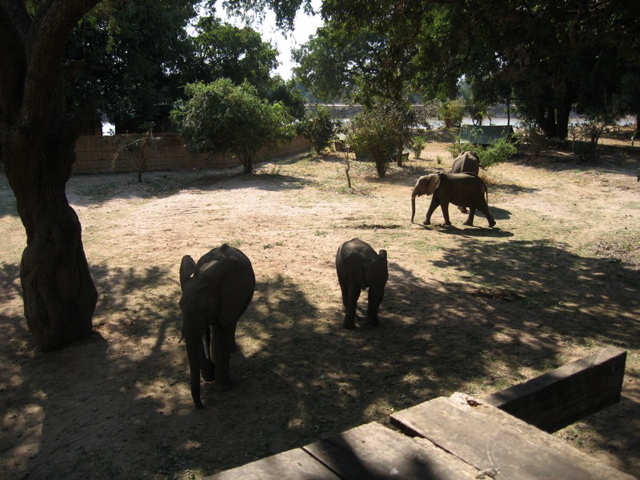 In the night the hippos come out of the river and eat under the tent. 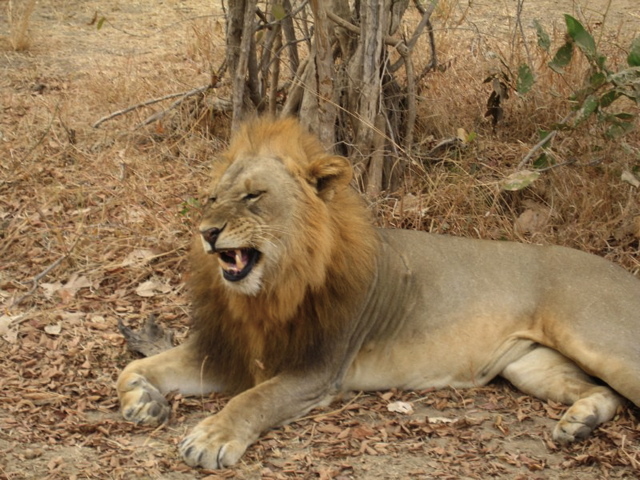 This entry was posted in Elephant, Fanny, KTM, Lion, Rupert. Tagged Best Chinese restaurant in Africa, Livingstone, Lusaka, Rosie Pilcher, South Luangwa, Victoria falls. This is incredibly sad. It is half a century since I travelled in Zambia At that time Chinese influence was being resisted by UK, US, and Europe, but corruption was rife. Road maintenance and trade goods were mainly Chinese. The countries were beautiful. 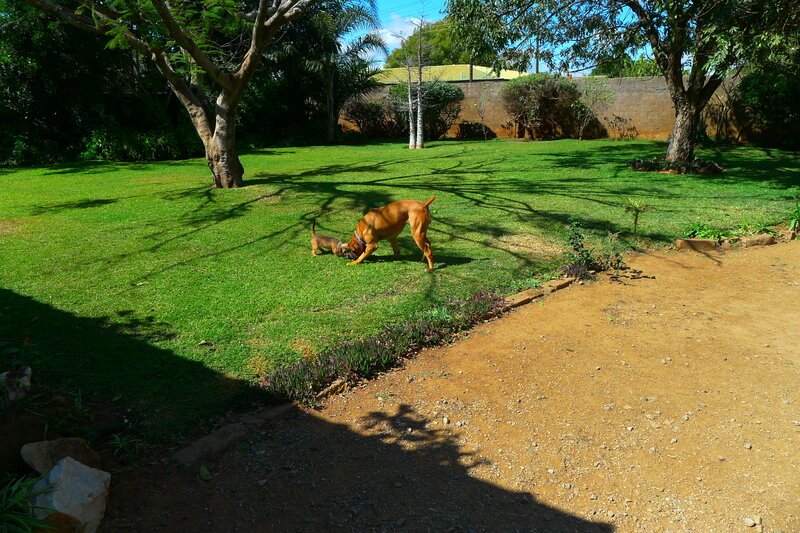 Lusaka was a thriving city with some wonderful buildings and no-one needed electric fences and gates – a couple of dogs was enough. My brother worked at the University and was the model for the portrait of St. Peter in the new stained glass window of Lusaka Cathedral. I think my neighbour in Arniston, Prof. Ron Kirby (Architect) had something to do with the design of new Lusaka cathedral.